As part of our international promotions program which is conducted annually. in association with AOL Corporation, Budweiser and Barclays Bank Plc London (Official Bank). 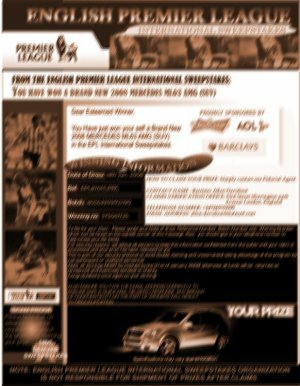 from our EPL International Sweepstakes Organization in London. CLAIMS VERIFICATION OFFICE: 53rd Street Shavington Park Avenue London, England. and Winning Number, which can be found on the top-left corner of this message. Also, you should give in your telephone number to help contact you easily. from the public until your claim is processed and your prize has been released to you. advantage of this programme by non-participant or unofficial personnel. Note, all winnings MUST be claimed by the 31st of January 2007, otherwise your prize will be returned as Unclaimed. A Scanned copy of your confirmation with a picture of your prize has been attached to his mail.